History remains a precarious field of study. Readers of history often avow historical writings as fact upon their publication by scholars. Historians are meant to investigate the past and document their findings in an objective manner. Objectivity being the key, historians nonetheless shape history into a narrative format better understood by their readers, hence the adage, “History was written by the winners,” which implies that historians are subjective scholars. Whether by design or merely an unintentional result of a particular historian’s chosen topic, the passions of a historian bring a perspective to the historical document, resulting in an analysis shaped by subjective forces. Even worse, there are historians, rare though they may be, who are incapable of objectivity and propagandize their analyses in order to put forth their specific perspective on historical events. In Denial, veteran character actor Timothy Spall plays David Irving, a British historian best known for his 1977 book Hitler’s War, which suggested Adolf Hitler had no knowledge of the mass genocide occurring in Auschwitz or other Nazi death camps. A decade later, Irving released a new edition of his book and therein claimed the Holocaust never occurred. Infamously contentious to those who disagree with him, Irving remains a Holocaust denier to this day. Spall plays him in such a chilling, belligerent way as to give the viewer goosebumps. He shouts across rooms and proclaims his opinion with loose attention to facts and concerted attention to feeling. As a rabble rouser broadcasting hateful commentary on race and horrifyingly twisted ideas about history, Irving emulates the calculating and warped sensibilities of Hitler, as well as some striking modern day parallels to the current U.S. election. Irving occupies the antagonist role in Denial. 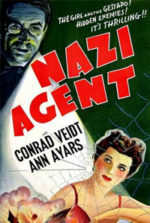 The film largely follows Deborah Lipstadt, an American historian who wrote Denying the Holocaust, a 1993 publication that considers the reasons why people refuse to acknowledge the Holocaust ever existed. With a heavy Bronx accent, Rachel Weisz, one of our finest performers, delivers Lipstadt with her signature no apologies attitude. In 1996, Irving filed a libel suit against Lipstadt and her publisher, Penguin Books, in a London court, insisting that Lipstadt’s book portrayed him as Anti-Semitic and a lousy historian, given his distortion of the facts. But because he filed the suit in London, libel law in England requires the plaintiff prove her case; the burden of proof remains not on the prosecution, as it does in America, but on the defense. 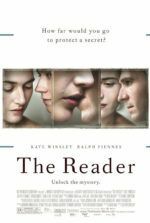 The film follows Lipstadt who, rather than settle to avoid a costly and time-consuming court case, resolves to defend her book and her assertion that Irving’s views intentionally distorted history. Fighting alongside our hero are her solicitor Anthony Julius (Andrew Scott) and her barrister Richard Rampton (Tom Wilkinson), both of whom are faced with proving Irving to be a lousy historian and proving in court that the Holocaust did, in fact, happen. Finding scientific proof of these atrocities proves harder than it would seem, given that fifty years had passed and countless distortions of the facts had occurred in that time. In preparing for their case, Lipstadt and her legal team must visit the remains of the Auschwitz site, and their experience is both sobering and brings insight into the characters, particularly the nuanced portrayal of Rampton. Meanwhile, Holocaust survivors want to use the trial as a platform to get their stories out, but Lipstadt’s legal team refuses to let them speak; they also ban Lipstadt from taking the stand, as it would distract from their target: Irving. 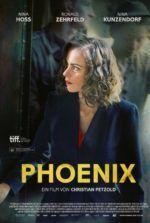 Directed with occasional heavy-handedness by Mick Jackson—a British filmmaker strangely responsible for L.A. stories like Volcano and, yes, L.A. Story—the film occasionally descends into unnecessary pictures in Lipstadt’s mind, as her empathy tries to envision what Holocaust victims must have suffered. 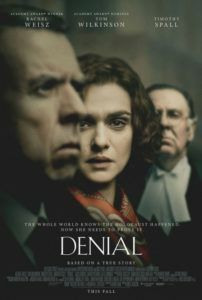 Denial was written by screenwriter David Hare, a playwright working from Lipstadt’s 2005 book, History on Trial: My Day in Court with a Holocaust Denier. Hare tailors his treatment to audiences accustomed to standard courtroom dramas; however, the subject matter and emotions involved support the sometimes dry, certainly predictable theatrics of the genre. Hare’s script also dwells on the details of the British court system in an obvious bid to inform U.S. viewers undoubtedly naïve to the crucial differences. The actual courtroom scenes play out in exciting fashion, especially given Lipstadt’s required silence. At the same time, Irving, a charismatic and vile egomaniac who serves as his own attorney, spouts hate in open court in a pathetic attempt to justify his career. Denial even proves suspenseful, perhaps because the viewer cannot wait to see Irving be put in his place. Though Weisz serves as the film’s heart, Spall’s scowling performance proves the lynchpin to the entire experience. Consider the scenes where Denial drops horrific proof of Irving’s monstrosity, such as the “racist ditty” he sings to his young daughter, or his casual remarks to a shocked journalist about the breast size of his servants, all women of color. This poisonous, awful character is brought to incredible life by Spall. Watching Lipstadt receive her victory over this man more than heightens this story above the downfalls of a typical courtroom drama.